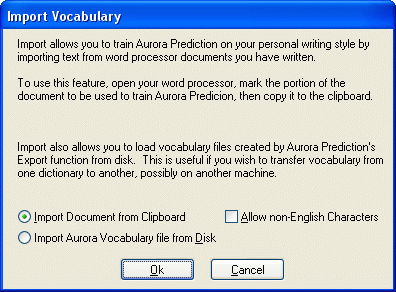 The Import Vocabulary dialog allows you to import vocabulary and your writing style from documents you have written previously, or from special Aurora vocabulary files on disk in order to train Prediction on your personal writing style and make it more effective. If this radio button is selected when you click on OK, Aurora Prediction will display a verification box to make sure that it is going to import the text you intended, then import that text, learning new words and the writing style of the document's author. This is great for getting Aurora Prediction up to speed as quickly as possible when you first start using it. Mark the text you want Prediction to train on in your word processor or other application. Copy that text to the clipboard using the word processor or other application's menus. Click on the Import Document from Clipboard radio button. If you have successfully copied the text to the clipboard, a confirmation dialog will appear. Check that the text is correct in the verification dialog. If the confirmation dialog does not appear, there was a problem copying the text into the clipboard, and you should try again. Click on Yes if it is the text you want, otherwise no. A status indicator will appear while it imports. If this radio button is selected when you click on OK, Aurora Prediction will open a file selection dialog where you can choose an Aurora Vocabulary file you have previously created using the Export feature. This is great for transferring vocabulary, macros and definitions and other word information from one dictionary file to another. This is especially useful for administrators, trainers and installers who set up macros and specialized vocabulary ahead of time to allow them to enter it once, then import it into other dictionary files. Create a vocabulary file using the Export feature. Click on the Import Aurora Vocabulary File from Disk radio button. A file selection dialog will appear, select the previously created file and click on OK. A status indicator will appear while it imports. If you have logged your spelling errors for later analysis you can use the Import feature to convert your spelling errors into automatic spelling corrections automatically. In the file selection dialog, choose the file ERRORS.TXT, this is the file that is created to log spelling errors. Note that this file name can be changed in aurora.set so that may not be the name if you have changed that setting. You can find out more about his under the Log Spelling Errors feature. If this checkbox is checked, Import will not restrict the importing of text to A-Z, but will allow accented characters to be imported. Note that if you accidentally import a binary or other non-text file that this will allow that junk to get into the dictionary file during import.